Here, a parotid gland tumor is shown. 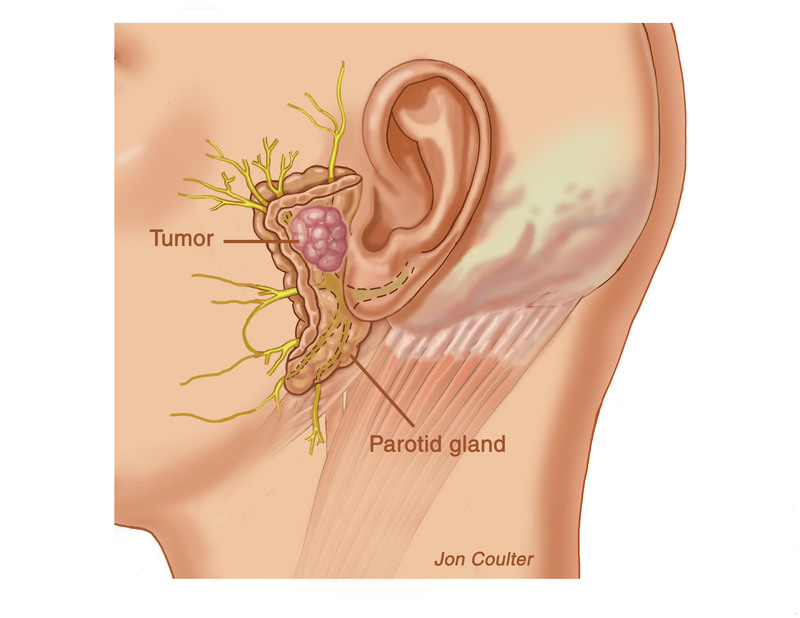 The most common tumor affecting the facial nerve is one that arises within the parotid gland. All parotid tumors that cause a facial paralysis are malignant. Symptoms include a painful mass within the gland and facial paralysis. Benign and malignant tumors that arise within the area of the skull base can also secondarily affect facial nerve function. These include meningiomas, paragangliomas (glomus tumors), chondrosarcomas, and chordomas. Each has their unique set of problems related to the type of tumor and the extent of involvement. Benign tumors that arise directly from the facial nerve are relatively uncommon. These schwannomas arise from the cells that produce myelin, the outer insulating layer of nerve fibers. They usually present with twitching of the face followed by weakness. These tumors are found more commonly within the bony canal that courses through the temporal bone. There, as the tumor expands, it exerts pressure against the nerve. Infrequently, schwannomas can affect the facial nerve branches traveling through the parotid gland. Patients may present with weakness of that branch of the facial nerve. Because there is room for expansion, symptoms may not appear until the tumors are rather large.